The lack of air exchange as the basis for local air exchange processes is the result of a high frequency of near-ground temperature inversions. Figure 3.3 shows the occurrence of the inversions relevant for air hygiene up to an altitude of 700 m above ground according to altitude and seasons. 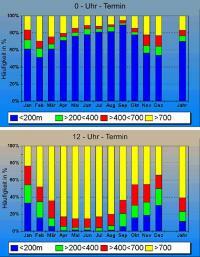 The data was provided by the German Meteorological Service, measured at the aerological station Stuttgart-Schnarrenberg, which is representative for this climatic region. A distinction is also made between the observation times noon and midnight (ascents of the balloon soundings). The statistics show that inversions immediately above the ground (ground inversions), indicating a stable thermal stratification of the air in the ground layer with cold air at the bottom (0-200 m), are to be expected in 70 % of all nights per year. This frequency reaches even 83 % up to an altitude of 700 m. These inversions occur in 40 % of all cases even during the day (noon). Ground inversions at daytime occur preferentially in autumn and winter months as insolation and therefore the warming of the air in the ground layer is minor then. Night inversions occur most frequently between May and October, but they are not very powerful and usually dissolve during the day.